"I write romance blended with mystery and intrigue and bad guys that you just want to see hang. Perfectly imperfect heroes and heroines. And always a happily ever after. -- Suzan Tisdale"
The main character is incredibly childish girl named Rachel whose every move invokes anger, sadness, and feelings of ridiculousness. She is conniving and spends a lot of time worrying about herself, immediately followed by extreme pity parties of how her actions effect and hurt those around her. Defiance is the perfect word to describe this book in the series. Granted, some of the laws in the town are archaic and belittling to women, but she is arrogant and the author takes her rebellion and glorifies it without showing the quality of law and order. Then again, the whole time I listened to the book I felt like cheering her on and verbally slapping her. I'm still extremely early in the book but am already very annoyed with the girl. So, I'd say the writing is good. The author's writing invokes feeling and is addictive. Part of me dislikes Rachel. I hope at some point in the book she grows up and realizes the consequences of her actions, she never sticks with a plan, and the need to think things through. 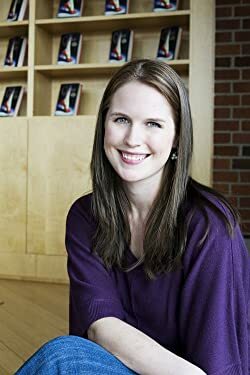 Marissa Meyer was born and raised in Tacoma, Washington, home of Almond Roca and Stadium High School, which was made famous when Heath Ledger danced down the stadium steps in 10 Things I Hate About You. Marissa didn't actually go to Stadium High School, but she did attend Pacific Lutheran University, where she earned her bachelor's degree in Creative Writing. She still lives in Tacoma, now with her husband. Cinder is her YA debut. Rebecca Soler is a film and voiceover actress who won a 2009 AudioFile Earphones Award for her narration of After by Amy Efaw. Her audiobook credits include work by authors such as Judy Blume, James Patterson and Sarah Dessen. Soler has also narrated the popular young adult series The Lunar Chronicles by Marissa Meyer. Her voice over credits include various video games, like Star Wars: The Old Republic and Red Dead Redemption and television shows such as Pokemon, Yu-Gi-Oh, and Teenage Mutant Ninja Turtles. She lives in New York City. Update: This book is available for purchase and received a five star review. This book includes a preview of the final book, winter. So, I'll spend the next 6-8 months patiently waiting for it to come out and then probably forget half the plot. The book just before this one left so, so many unanswered questions on the table so I'm glad from the preview that it sounds like we will be skipping back forward to the present. Waistcoats and Weaponry is a book in a series about daring adventure through Scottland, Britain, and the ether. This book in the series focuses more on werewolves and the reader finally gets to know more about Lady Kingair (Sidheag Maccon). My main blog, DesaraeVeit.com, is getting a little cluttered with various genres so I will be moving all my book reviews to this blog as of today. Other genres may also move to genre specific sites at a later date. Etiquette and Espionage is a spin off of Gail Carriger's steam-punk world that started with, "The Parasol Protectorate." I loved the Parasol Protectorate and many of Gail's other books. The Parasol Protectorate includes: Prudence, Soulless, Heartless, Blameless, and Changeless. More on that series in another review. 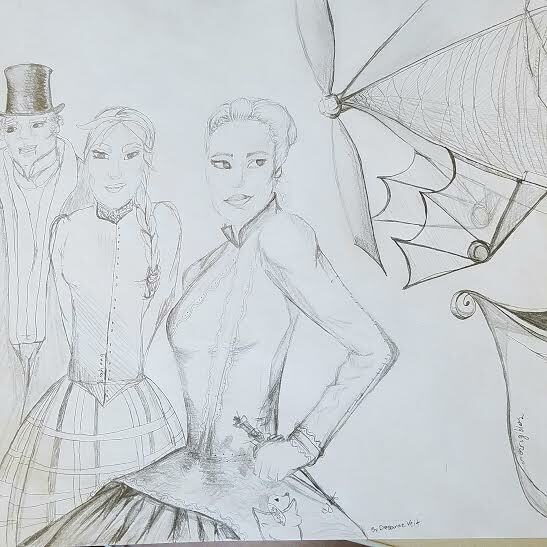 I made this drawing as a nod to the Finishing School series. I loved the books and made a quick doodle of some of the characters. Audible version Chapter sixteen where they are in the hive had me laughing out loud. My stomach hurts from the 'kerfuffle'. While hearing this nutty predicament I just had to start my review. The verbiage used in Gails books may only be described as smart. In an old school manner of intelligence, every book stands out with an amusing vocabulary and even more amusing antidotes.